Johannesburg Gutter Cleaners. Get A Quick Quote! We service all types of gutters including box, aluminium, copper, steel, plastic, vinyl, zinc, etc. Also ensuring that your downspouts are thoroughly cleaned. Contact The #1 Gutter Cleaning Company In Gauteng Today! Gutter Cleaning In Johannesburg – Gutters, in general, are taken for granted, especially when they’re working properly. But the moment they become clogged and cause a roof leak or rot and start smelling bad, we become aware of their presence and the role they actually play. The thing is, no one finds pleasure in cleaning out gutters, but if we don’t do it on a regular basis, we’ll end up replacing it which will cost a lot of money. So it’s better to just hire a professional gutter cleaning company to avoid the worst-case scenario. As we’ve mentioned before, if you don’t clean your gutters regularly, it will become blocked. Blocked gutters won’t allow water to be drained properly. This means that excess water will leak into your roof. A roof leak can cause serious damage to your roof as well as the structure, causing it to rot due to water damage. Not only will this ruin your home’s curb appeal, but it will also put the safety of your family at risk and cost you a lot of money to fix. Once your gutters fill up with leaves, debris and grit, it can create an ice dam on your roof during winter. Again, water damage is a serious and costly problem to have. But you’ll also have to deal with unwanted guests such as mosquitoes and other insects nesting in your roof and torturing your family. Other consequences of blocked gutters include sagging gutters, blocked drains and water damage to the exterior of your home. There are two options when it comes to cleaning your gutters. You can go the DIY route or request help from the professionals. If you decide to clean them yourself, you’ll need to invest in quality cleaning products and equipment. You can use a trowel to scoop the leaves and other debris up. A bucket would be handy to transfer it all into. Since gutter cleaning requires you to clean at certain heights and sometimes unreachable areas which can be dangerous to access, you’ll want to invest in a reliable ladder that can hold your weight to ensure your safety. Take care to wear gloves when handling dirt and debris to avoid serious cuts. Even small cuts can quickly become infected and end up sending you to the emergency room. Once you’ve acquired all the necessary tools, you’re ready to start the removal of debris and washing up of your gutters. It’s always advised to start shovelling out rubble from a drain outlet. Ladle up the debris and leaves by moving away from the drain outlet and collecting it in the bucket. It’s vital to keep your drain pipes clean as well. Clear them from any blockage by blasting water through them. 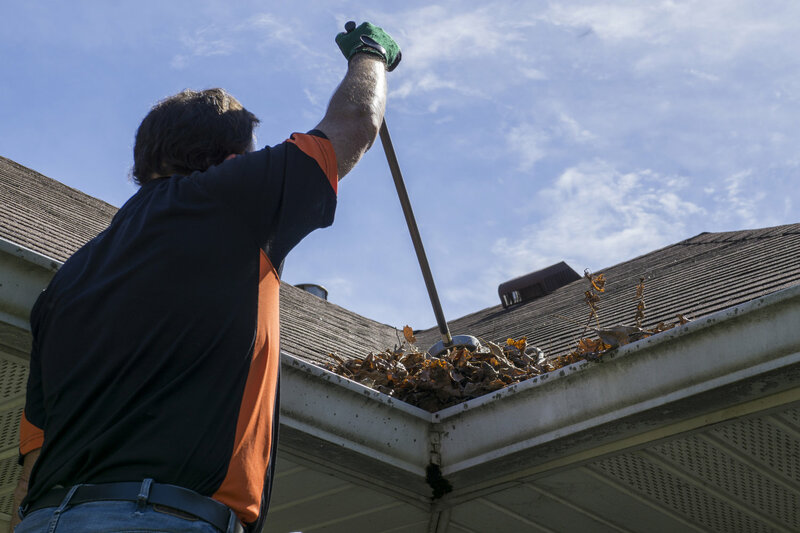 It’s not everyone’s cup of tea to spend hours upon hours cleaning out their gutters which is why you should consider hiring a gutter cleaner for the job. With ample experience and the needed skills and expertise to deliver outstanding gutter cleaning services and installations to old and new customers, you can have the results you want without lifting a finger. According to the experts, a good gutter clean is recommended every second month but in most cases, a bi-annual clean will do. At Painters Johannesburg we offer affordable gutter cleaning solutions for most of South Africa that will suit your needs and budget. Get in touch with the team for a FREE quote by sending us an email or feel free to give us a call! Alternatively, visit our blog for our top tips and tricks on gutter cleaning, painting your building’s windows, doors, floors and ceilings as well as pressure cleaning. Phone Painters Johannesburg today for a FREE quote!